Ever since I’ve been a photographer I’ve only known and used two editing programs, Adobe Photoshop and Adobe Lightroom. 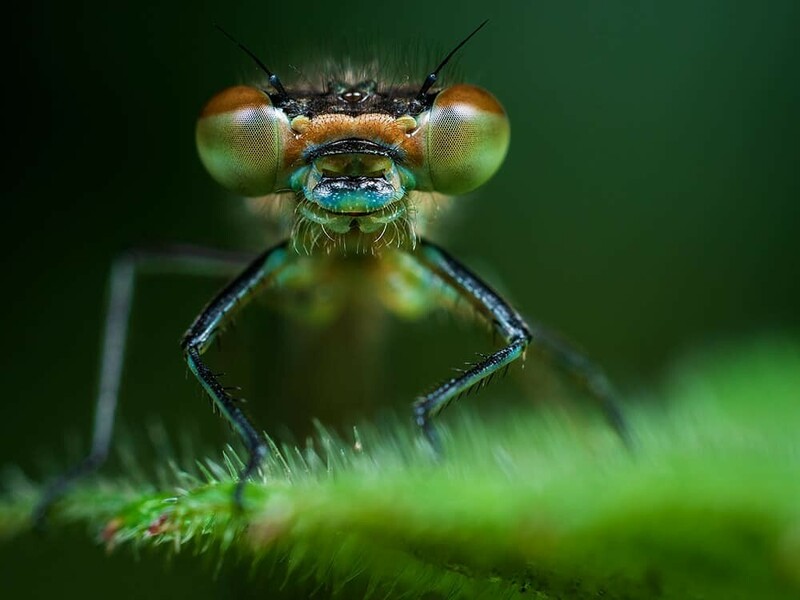 However, the big news cruising through photography circles is that now, there’s a new kid on the block and they’re already proven to be producing professional standard programs. Let me introduce you to Luminar and Aurora HDR by Skylum Software. The names immediately had me intrigued and after spending some time trialling the programs recently I wanted to share some screenshots and a review with you here on The Wandering Lens. The programs are very affordable in comparison to the Adobe subscriptions so it’s well worth having a little peek and seeing if it could work for you. It’s also timely because Aurora HDR 2019 has just been released! (Scroll down for a discount code!). 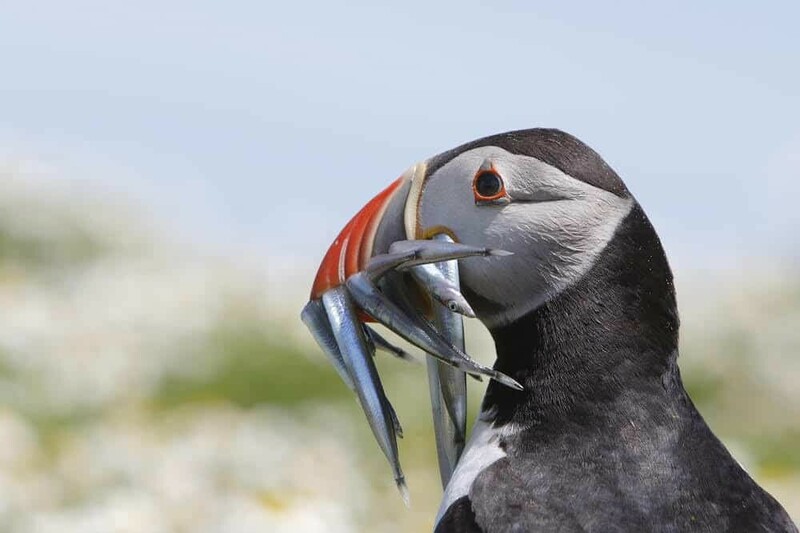 You’ll notice I don’t share much about editing on this site and that’s because I believe every photographer has a different preference in terms of how they go about their post processing. It’s a major part of the creative process and who am I to say this is how you should edit…instead I always think it’s best to play around with various techniques, software and to discover your own editing approach naturally because it is all part of the fun! It’s also best to be aware of all the options available to you and be open to new workflow solutions, hence the reason I’m sharing this article with you. Let’s get started with a little background on Skylum Software. 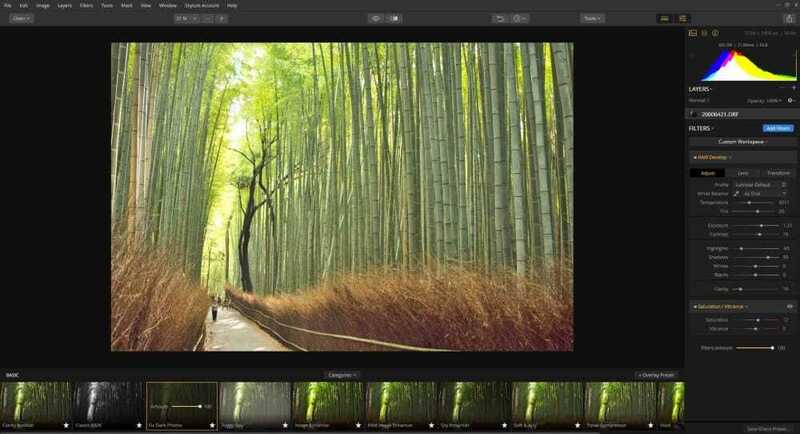 Initially developing mobile video and photo editing apps under the name Macphun (which were consistently named within the ‘Best iphone Apps’ each year), Skylum is now best known for its programs Luminar and Aurora HDR. 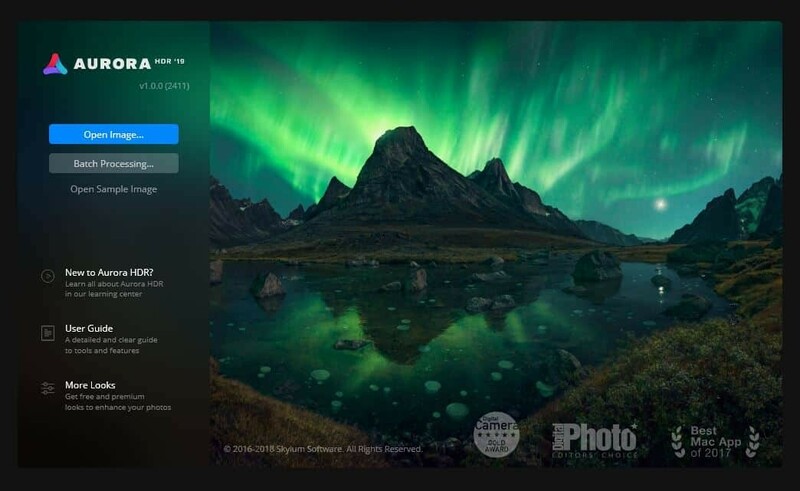 First launching Aurora HDR back in 2015, the program has since had a number of updates and Skylum partnered with well-known HDR photographer Trey Ratcliff to make it ideal for both professionals and amateurs alike. Following on with the launch of Luminar, a Lightroom alternative, in November 2016, Skylum quickly became a force on the editing scene due it’s user friendly programs. 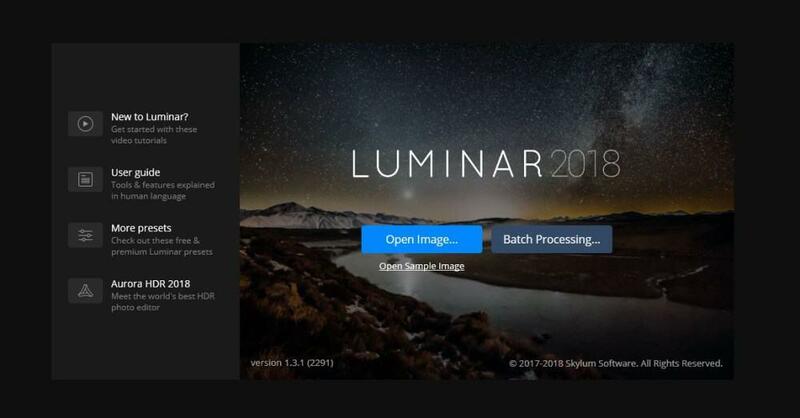 Fast forward to 2018, updates have been rolling in for Luminar and the brand new Aurora HDR 2019 is going to be ready for download in early October. Both programs offer the ability to import your RAW or JPEG files from any camera model and produce a variety of creative outcomes whether it’s simple adjustments or all out advanced HDR results. Everything is completely customisable from the presets and filters down to the layout and colour scheme…it’s yours to arrange how you wish. If you’re looking to produce an HDR effect, then this program will be just what you need. You can forget all the difficulties or in camera set up and actually just click a button that says ‘Create HDR’. It’s that simple. Of course, once you’ve clicked that option, you then progress through to the interface and make any adjustments that you wish. It’s a fully customisable program offering everything you’ve ever seen on Lightroom plus the addition of intelligent image recognition. 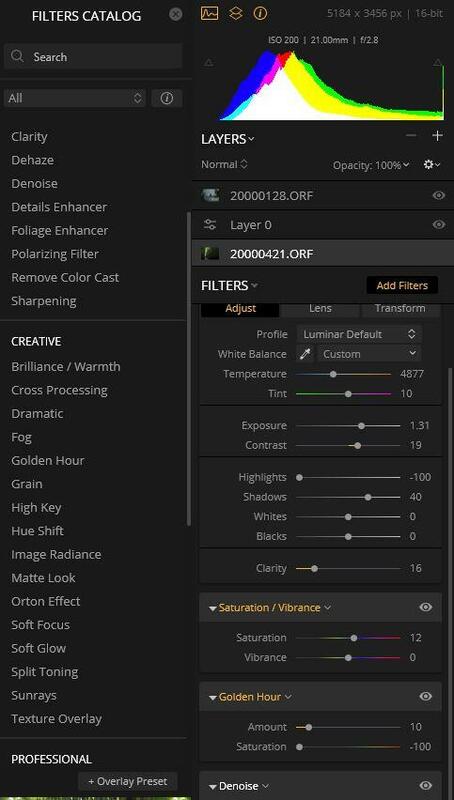 What I found instantly appealing on both Aurora HDR 2019 and Luminar is the adjustment toggles and filters are so familiar and so easy to use. That’s always my worry when trying something new, that I’ll take forever to get a grip on and I’ll end up spending more time editing that shooting. Take a peek below at a screenshot of the editing set up, it really is, easy peasy. 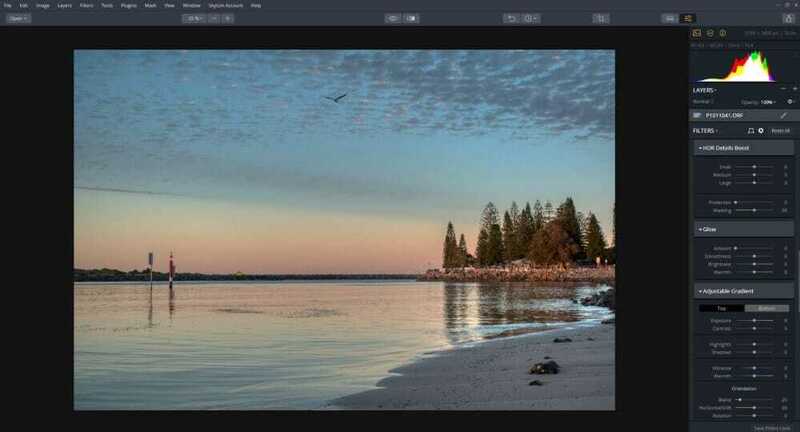 Aurora HDR 2019 has integrated the AI-powered Quantum HDR Engine, a new tone mapping tool that’s been written from scratch to quickly and efficiently create the most realistic, immersive high dynamic range photographs possible. 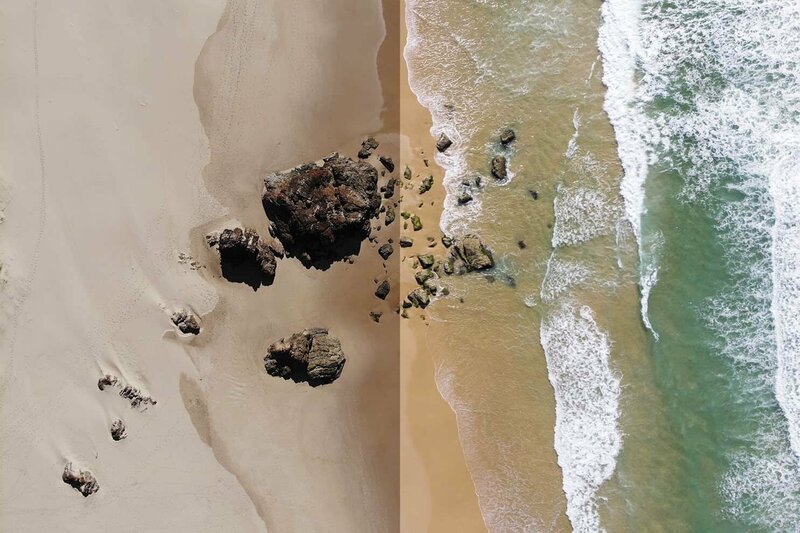 The engine effectively analyses your photos and intelligently merges them, making sure to avoid the major issues with other automated HDR merging tools. Using Aurora HDR 2019 you can produce professional quality HDR images for real estate, landscape, portraits and more, or if you’re not as into HDR (I prefer a softer outcome), you can also tone down the adjustments and create your own results. 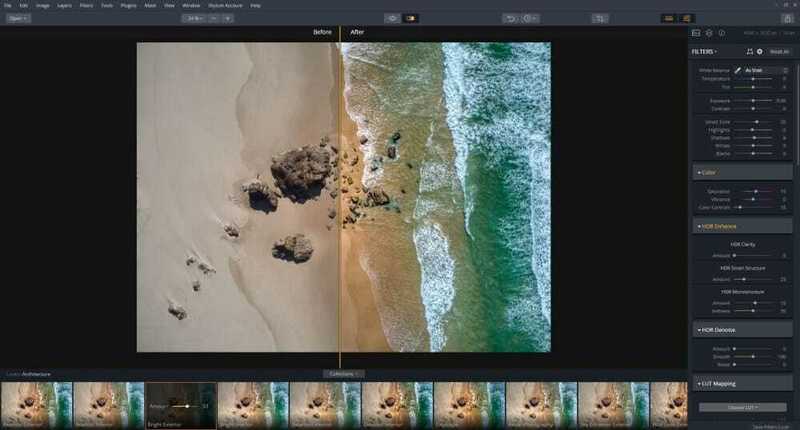 Aurora HDR 2019 was released on October 4th. 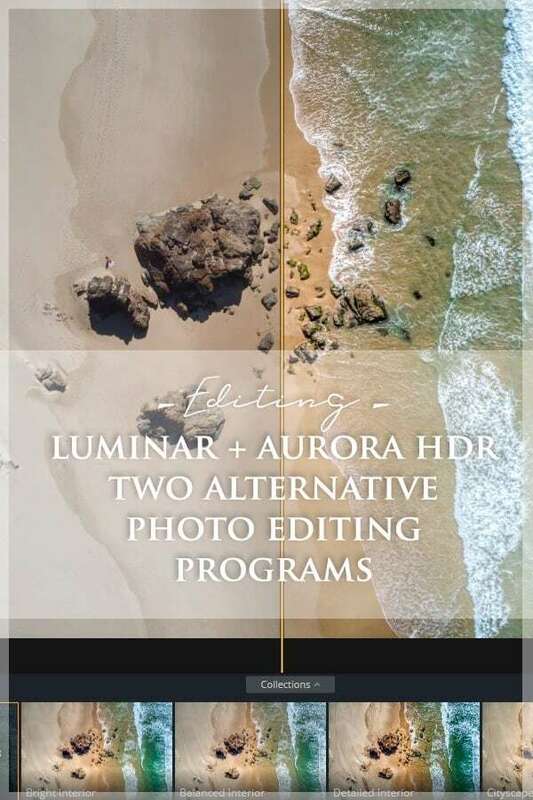 Order Aurora HDR 2019 here for only $89USD. Okay, so moving onto Luminar which, of the two programs is my favourite. This isn’t due to any technical features or gadgety improvements, it’s because as soon as I opened my first image, it just felt right. Luminar offers a simple approach to editing, you import your image click a preset option then adjust with filters (tools) as required. 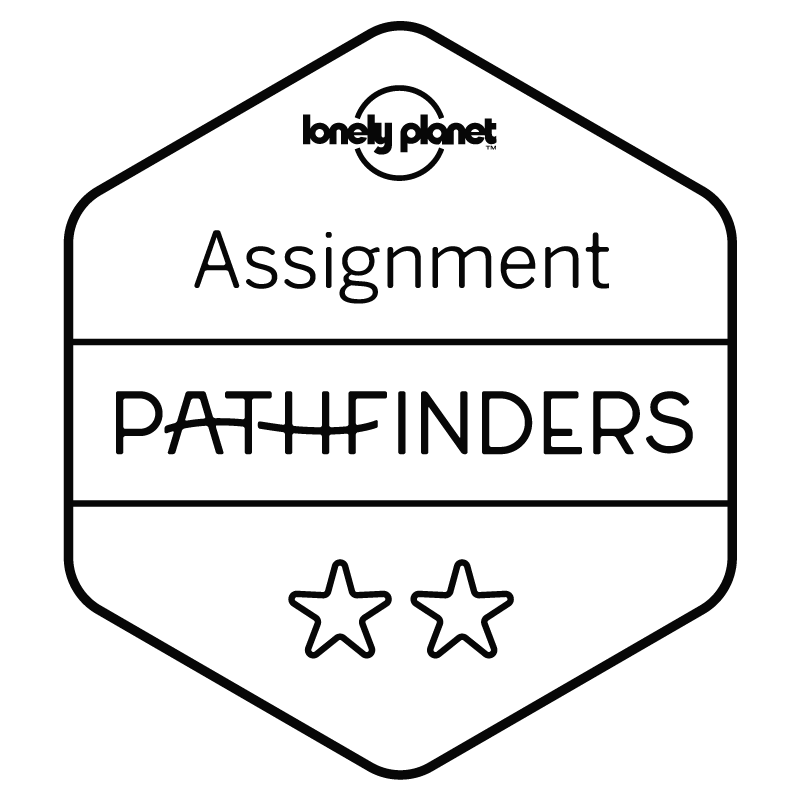 Alternatively, you can opt for a particular ‘Workspace’ which provides a curated selection of adjustable filters specifically relating to a type of photography such as portraits, landscape, black & white and so on. One feature that I really love using in Luminar is the slider bar (also available in Aurora HDR), which allows to you view the before and after of a single image. This helps to control how far you go…we’ve all had those moments when you’ve got carried away, this tool helps to hone in your crazy ideas and show you what reality looks like. It’s a nice little reminder not only of what the original looks like, but how damn amazing the final result looks in comparison. 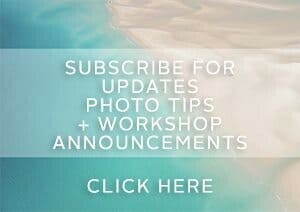 Alongside a host of presets, you can easily improve your workflow by finding what works best for your photography style and saving customised options. 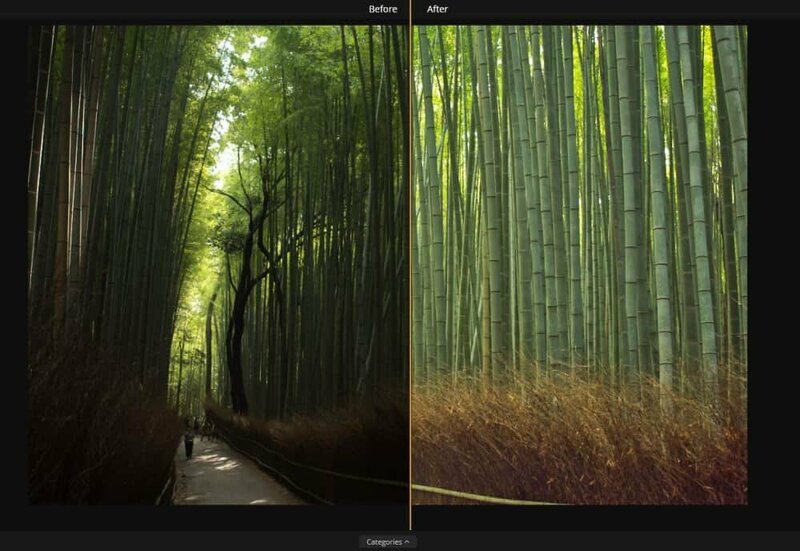 In the filters section there are a number of features to quickly improve your image. Accent AI – Let Luminar automatically analyse your image and make any adjustments it deems necessary. It saves time, is a one-click function and can be adjusted if you don’t like the final result. 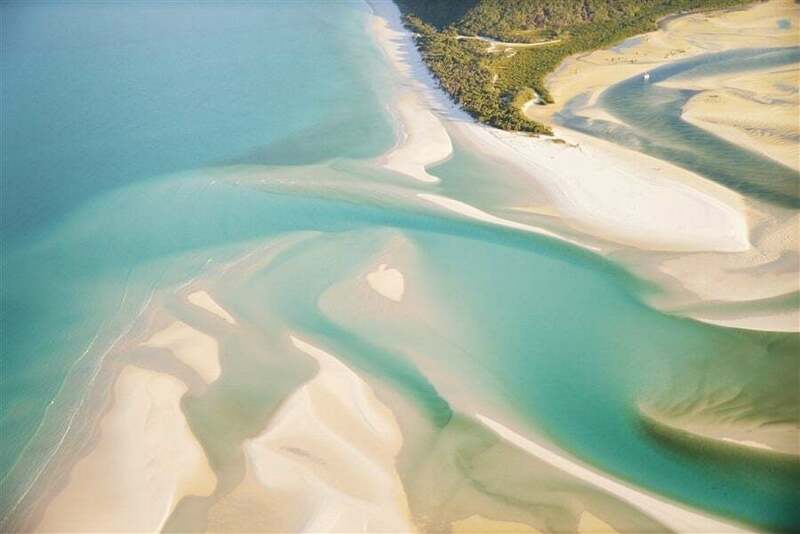 Polariser – Create bluer skies, reduce highlights, add depth to your image and improve the contrasting of clouds or subjects. Golden Hour – This is one of my favourites, add warmth and golden hues to your image just as if it were taken during the golden hour. Of course this works best when you’re working with an image actually taken during the golden hour and aims to enhance the beauty. Sun Rays – A feature that a lot of people will be very excited about, you can introduce sun rays into your image. Personally I like to keep things natural and work only with what was originally within the scene however, of all the editing programs, Luminar offers the most natural looking rays! The whole interface is completely customisable so you’re able to keep open filters relevant to your style. Actually on filters, they can be a little touchy so be aware when sliding the toggle to go easy and only make small changes at a time. Coupon Code – Use THEWANDERINGLENS at check out for a $10USD discount. Have you tried Aurora HDR or Luminar? Or do you have another editing system you like? 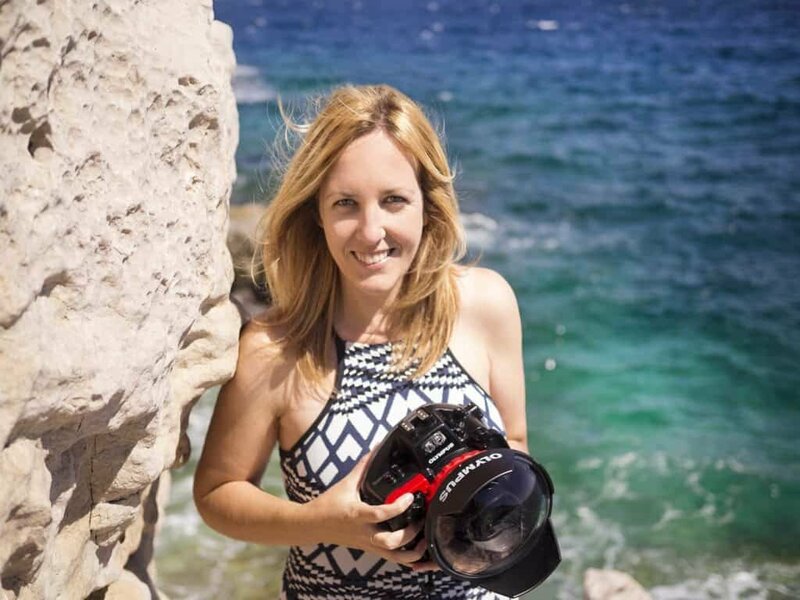 Travel and landscape photographer from Australia who is far more comfortable in a pair of flippers than heels! 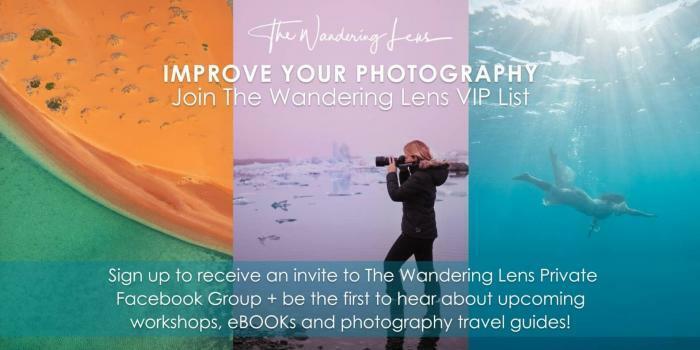 Having worked for publications such as Lonely Planet, Wanderlust and the Sunday Times, Lisa founded The Wandering Lens to share destination guides to the worlds most photogenic places and outdoor experiences.